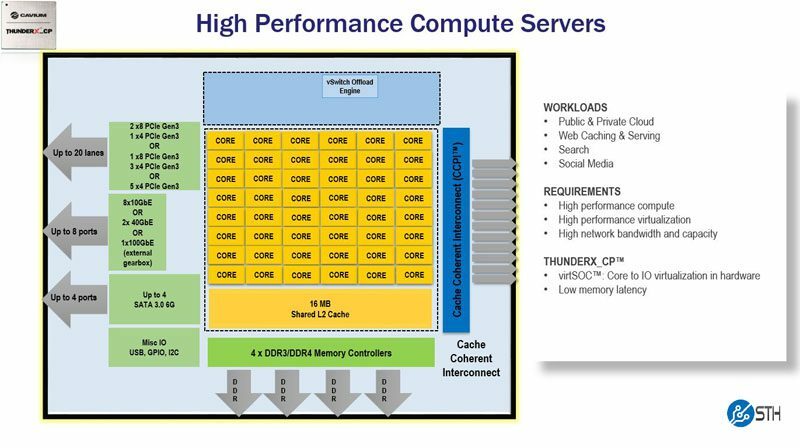 During our work with the Cavium ThunderX platform, we have had access to a single 48-core ARMv8 2.0GHz SKU. Cavium’s strategy is to target different processor models into different market. 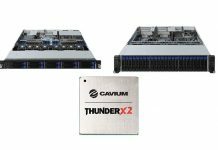 Aside from clock speed and core count, Cavium has feature-based differentiation for its different ThunderX product families. We received permission to publish information on the different SKUs and their unique features. 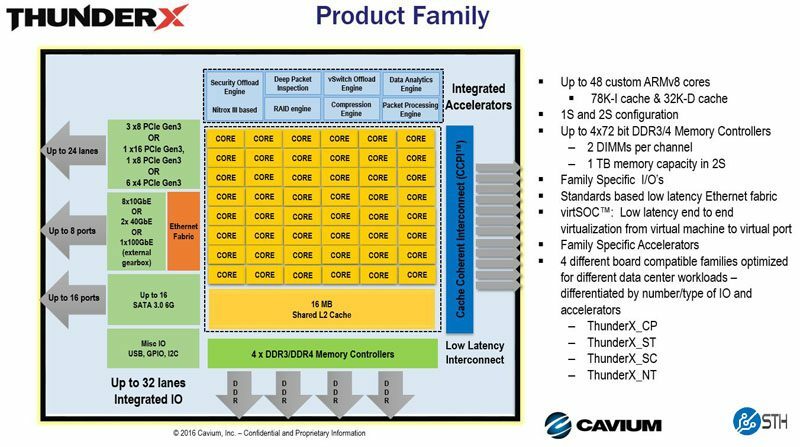 The four Cavium ThunderX families (ThunderX_CP, ThunderX_ST, ThunderX_SC, ThunderX_NT) have a similar base architecture. 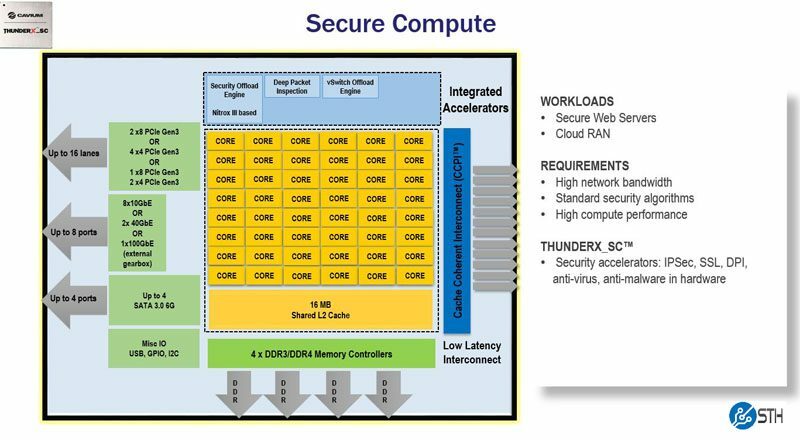 From this common architecture, each chip is tailored to its targeted application. There are a few common underpinnings but this is the basic block diagram that shows all potential components of the platform. The ThunderX_CP family is targeted at compute workloads. 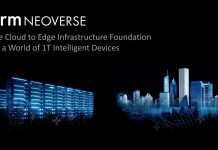 These chips target public and private clouds, web caching and web serving, search, social media and similar applications. The main accelerator in this family is the vSwitch Offload Engine. If you think about the application workload this is targeted at, one will take advantage of the high speed networking, multitude of cores and RAM bandwidth. With Cavium’s strong networking portfolio as well as 16x SATA III 6.0gbps ports (60% more than a comparable Intel single socket system), storage is an application where the ThunderX architecture is well suited. 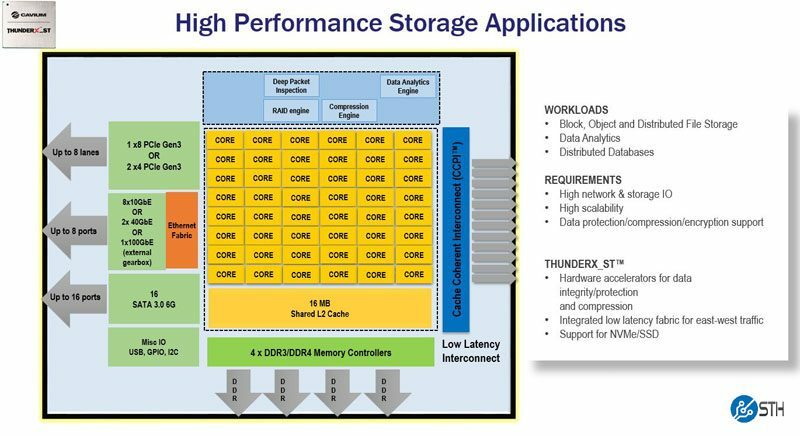 The ThunderX_ST family targets block, object and distributed file storage workloads, distributed database applications and Hadoop style workloads. It comes in 8-48 core variants and has additional hardware accelerators such as the compression engine available. Building on the high core count and the high-end networking throughput, the Cavium ThunderX_SC is focused on applications like eCommerce web servers. Cavium includes hardware accelerators for SSL, IPSec, deep packet inspection, anti-virus and anti-malware to free CPU cycles. Cavium has IP that it uses in dedicated Nitrox III chips that it leverages here. With Cavium’s background as a networking company, and given the specs of the ThunderX chips, one area we think the company will do well in is in the networking and SP cloud space. 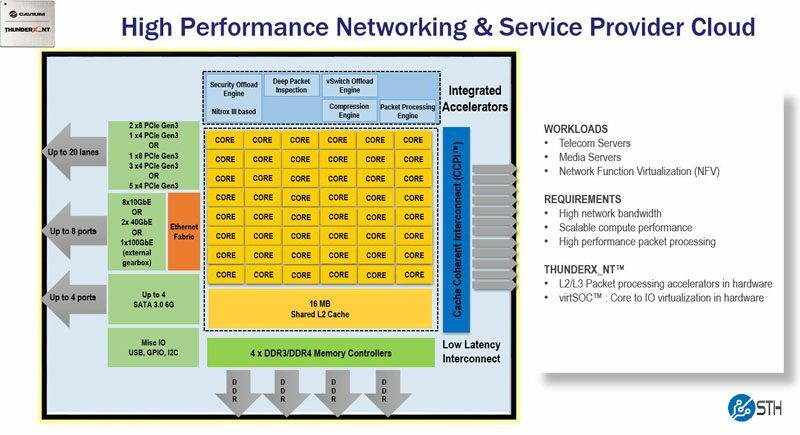 The ThunderX_NT targets network function virtualization (NFV) servers and the telecom clouds being deployed with a mix of high bandwidth along with hardware accelerators. Like the storage family, the networking focused family can scale from 8-48 cores. 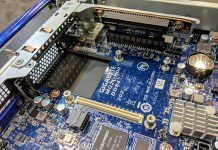 We have been working with a single socket Cavium ThunderX machine, the Gigabyte R120-T30 server thus far and the results have been impressive. Cavium is embracing a different approach to product differentiation than Intel. While Intel is generally focused on raw x86 performance, Cavium’s SoC design allows it to differentiate on features. This can include networking, storage accelerators and other vectors. The Cavium ThunderX family is the first ARMv8 chip we have seen, in production, that can legitimately match and outpace parts of the Intel Xeon E5 line in terms of performance.